Emma Clay, M.D. joins SoCal Eye from the UCLA Medical Center, Jules Stein Eye Institute, Department of Ophthalmology. Dr. Clay completed her eye surgery training after graduating from Jefferson Medical College in Philadelphia, Pennsylvania. During her time in medical school, Emma Clay, M.D. was inducted into the prestigious medical honor society Alpha Omega Alpha, and has received numerous other honors and awards. 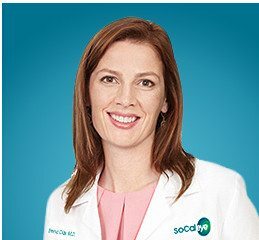 Since joining SoCal Eye, she has been appointed a fellow in the American Academy of Ophthalmology and the American College of Surgeons, and a diplomate of the American Board of Ophthalmology. For the last ten years, Dr. Emma Clay has been actively involved in performing the full spectrum of eye surgery. Her expertise in small incision cataract removal, and implantation of monofocal, toric, accommodating, and multifocal intraocular lens implants provides our patients with many vision-correcting options. For patients interested in laser vision correction, Dr. Emma Clay is certified in numerous refractive procedures, including LASIK, PRK, PTK, and clear corneal lens exchange. Dr. Clay also has a special interest in facial rejuvenation, and performs upper and lower lid blepharoplasties. Antiaging treatments include Botox, Dysport, and Restylane injections. Dr. Emma Clay believes in being an active member of her community and lectures to numerous local and retirement groups. She is also a consultant at the Veterans Hospital in Long Beach and appreciates the opportunity to give back to those who have served our country. Hollander DA, Clay EL, Sidikaro Y, Infectious Crystalline Keratopathy Associated with Intravitreal and Posterior Subtenon Triamcinolone Acetonide Injections, Br J Ophthalmology. 2006, May; 90 (5): 656. Emma Clay, Richard Ou, Jonathan Davidorf, Ocular Trauma and Emergencies, In: Agarwal, A, ed. Handbook of Ophthalmology, New Jersey: Slack; 2005:539-564. SI Murthy, EL Clay, RC Wang, E Zamir, NA Roa, Irreversible Late Visual Loss in Vogt Koyanagi Harada Disease. (2001). Abstract presented at the Association for Research in Vision and Ophthalmology, Ft. Lauderdale, FL. Melissa A. Carran, Kohler G. Christian, David S. Glosser, Alicia A. Romero, Emma L. Clay, Michael J. O’Connor, Michael R. Sperling (1999). Anxiety Disorder and the Amygdala in Patients with an Aura of Fear. Abstract presented at the American Epilepsy Society 53rd Annual Meeting, December 1999. “Treatment of Non-infectious Anterior Uveitis with Infliximab”, Presented at 2005 JSEI Clinical and Research Seminar, Jules Stein Eye Institute, UCLA, Los Angeles, CA. “Infliximab for Uveitis Resistant to Etanercept”, Presented at 2004 American Uveitis Society Meeting, at American Academy of Ophthalmology, New Orleans, 2004. Dr. Clay speaks Spanish and enjoys swimming, tennis, running, and art history. Lakewood Eye Physicians and Surgeons, Inc.